Buy Gold: Will Gold Crash? Gold is rising at a meteoric rate and some media are predicting that gold is going to crash, that it is in a bubble and cannot sustain such a rise. This looks like a true possibility on the face of it but lets look closer at what is happening. 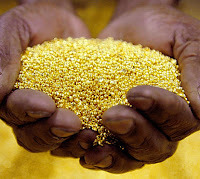 Much of the rise in gold is not an increase in the value of gold. It is a decrease in the value of the currencies by which the value of gold is measured. Anyone can check this themselves by looking at the amount of currencies needed to purchase any item over a period of time. How much did groceries, white goods, even newspapers, fuel, even real estate cost 5, 10 20 years ago. The value of the dollar has decrease steadily over the years and with the recent debacle over debt, credit ratings also affecting the value of the dollar, for example, this has been exacerbated resulting in more and more people seeking safety for their assets in their own defense. Over hundreds of years, gold has proven to be a save house for people wishing to preserve their assets and savings. Gold does not change. It remains gold and remains a perceived value. Currencies, not backed by anything more substantial than fast fading confidence have demonstrated a failure to be a safe haven. Not only are interest rates now at an all time low, bonds are not the 'safe' investment they onces were considered to be and it is hard metal that retains its intrinsic value. So will gold crash? Under the circumstances it is most unlikely given that it is not gold that is losing its value but the currency by which it is measured. For gold to 'crash' the value of the currency would need to jump up markedly and with the rising and almost unsurmountable debt accumulated by the US and Europe it is most unlikely that currencies are going to inspire any confidence again anytime soon. Even if profit takers move in and there is a drop in the price of around 10 to 20 percent, that will still leave gold in a far better position than the dollar or euro. Besides which, as the debt continues to mount and value of currencies continue to deteriorate, gold will go not go anywhere but up.